Our Original "Flare and Fancy" top is a must have for every women's wardrobe. 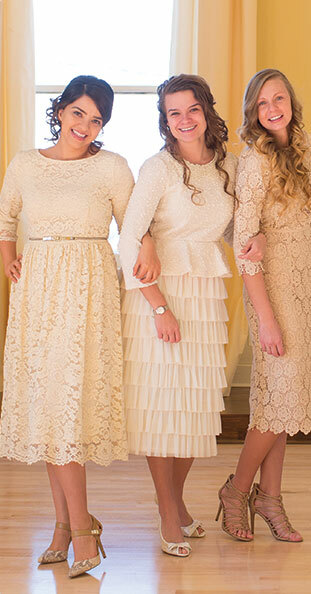 It's the perfect 3/4 modest sleeve lace top. You can pair it with the matching skirt, available on our website. Or pair it with your own pencil skirt, Tuck it into your favorite flair skirt, the possibilities are endless! We have lots of colors for you too. It's made with the ever soft custom made lace. If you own a Night in Paris dress, this is the same lace! It's a favorite by all. Mix up colors for more of a variety! Or order one color skirt, with 2 color tops! Fitted, minimal stretch. Model in cream wears size medium in Dainty Jewell's. Model in mint and black is wearing a size medium top and a size large skirt. Model in navy and blush wears size small in Dainty Jewell's. It is beautiful and fits great! I am very happy I've purchased three of these shirts so far. I've gotten a lot of use out of them. The fit is very flattering and they work with so many outfits. I think the length is perfect. My daughters received their flare & fancy skirt & top and love them. Both items fit to a tee and look amazing on them. I purchased this top along with the the matching skirt to wear at a wedding in April. I was very pleased with the quality and the style. I like that the back zipper zips down far enough that you can put on easily. The ribbon belt is nice too! Long enough to make a bow or to just make a simple knot. I am 5'9 and 155 pounds and I ordered this in a Large and it fits modestly. I have purchased this top in 5 colors. I love how I can mix and match it with the matching skirt, or other skirts. The lace is so soft and feminine, fits perfect, and brings many compliments! I received this outfit for my sister's wedding. It is very classy and beautiful. I got it quickly after it was ordered. So gorgeous! Fancy and comfort finally meet! I love this and the fit is perfect! This top is another winner for Dainty Jewell's. Beautiful, comfortable, tasteful and modest. I ordered the black top and after seeing how lovely it is I may just have to get the skirt to go along with it! I am so glad that I found Dainty Jewell's! I just love their clothing.